Do more with Hefty Strong Large Trash Bags. Versatile and strong, these heavy duty bags are ideal for extra-large kitchen cans or big clean-up jobs throughout the home, yard and garage. Signature Hefty heavy-duty quality ensures superior puncture resistance and drawstring dependability. Large 30 gallon size and thicker plastic are ideal for tackling kitchen mess, post-party clean-up, seasonal item storage, donations, or basement and garage clean-up. Every package includes one Box Top to help you earn cash for your school. 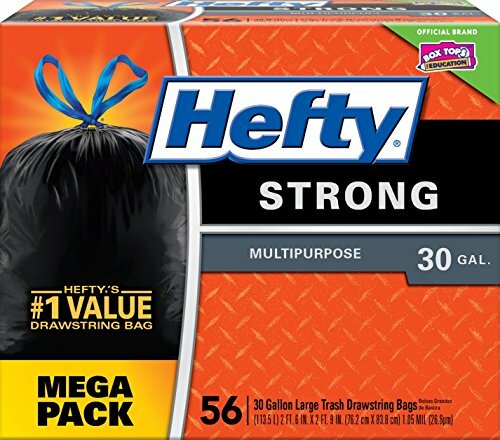 Versatile and strong, these heavy duty Hefty bags are ideal for extra-large kitchen cans or big clean-up jobs throughout the home, yard and garage. Large, 30 gallon size and thicker plastic are ideal for tackling kitchen mess, post-party clean-up, seasonal item storage, donations, or basement and garage clean-up.